I’ve already mentioned KeckCAVES‘ involvement in NASA‘s newest Mars mission, the Mars Science Laboratory, in a previous post, but now I have an update. Dawn Sumner, UC Davis‘ member of the Curiosity science team, was interviewed last week for “Onward California,” which I guess is some new system-wide outreach and public relations effort to get the public’s mind off last fall’s “unpleasantries.” Just kidding UC, you know I love you. Anyway… Dawn decided that the best way to talk about her work on Mars would be to do the interview in the CAVE, showing how our software, particularly Crusta Mars, was used during the planning stages of the mission, specifically landing site selection. I then suggested that it would be really nice to do part of the interview about the rover itself, using a life-size and high-resolution 3D model of the rover. So Dawn went to her contacts at the Jet Propulsion Laboratory, and managed to get us a very detailed 3D model, made of several million polygons and high-resolution textures, to load into the CAVE. 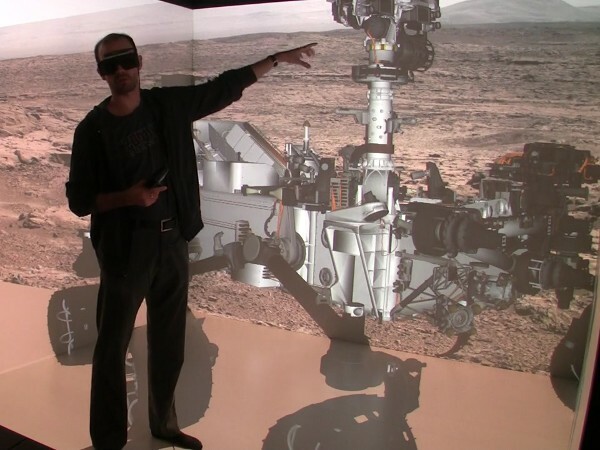 What someone posing with a life-size 3D model of the Mars Curiosity rover might look like. As it so happens, I have a 3D mesh viewer that was able to load and render the model (which came in Alias|Wavefront OBJ format), with some missing features, specifically no specularity and bump mapping. The renderer is fast enough to draw the full, undecimated mesh at sufficient frame rate for immersive display, around 30 frames per second. The next problem, then, was how to film the beautiful rover model in the CAVE without making it look like garbage, another topic about which I’ve posted before. The film team, from the Department of the 4th Dimension, fortunately was on board, and filmed the interview in several segments, using hand-held and static camera setups. We have pretty much figured out how to film hand-held video using a secondary head tracker attached to the camera, but static setups where the camera is outside the CAVE, and hence outside the tracking system’s range, always take a lot of trial and error to set up. For good video quality, one has to precisely measure the 3D position of the camera lens relative to the CAVE and then configure that in the CAVE software. Previously, I used to do that by guesstimating the camera position, entering the values into the configuration file, and then using a Vrui calibration utility to visually judge the setup’s correctness. This involves looking at the image and why it’s wrong, mentally changing the camera position to correct for the wrongness, editing the configuration file, and repeating the whole process until it looks OK. Quite annoying that, especially if there’s an entire film crew sitting in the room checking their watches and rolling their eyes. Pay particular attention to the edges and corners of the CAVE, and how the image of the 3D model and the image backdrop seamlessly span the three visible CAVE screens (left, back, floor). That’s what a properly set up CAVE video is supposed to look like. Also note that I set up the right CAVE wall to be rendered for my own point of view, in stereo, so that I could properly interact with the 3D model and knew what I was pointing at. Without such a split-CAVE setup, it’s very hard to use the CAVE when in filming mode. The filming support vislet supports head-tracked recording, static recording, split-CAVE recording (where some screens are rendered for the user, and some for the camera), setting up custom light sources, and a draggable calibration grid and input device markers to simplify calibrating a static camera setup when the camera is outside the tracking system’s range and cannot be measured directly. All in all, it works quite well, and is a significant improvement over the previous setup method. It is now possible to change filming modes and camera setups from within a running application, without having to exit, edit configuration files, and restart. This entry was posted in VR Applications, VR Methods, VR Software and tagged Calibration, CAVE, CAVE filming, Crusta Mars, Curiosity rover, Head tracking, movies, MSL, NASA, Vislet, Vrui by okreylos. Bookmark the permalink.